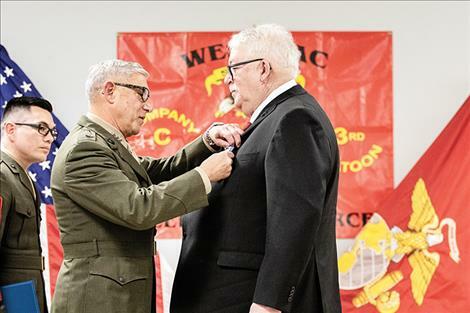 Valley Journal: Lieutenant General Frank Libutti pins the Navy Cross on Lance Cpl. James Stogner. 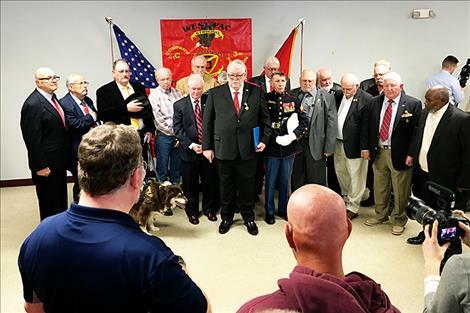 Veteran Marines at the ceremony stand together at the VFW. Marine veteran Cpl. David Miller emotionally recalls the events of April 5, 1967. 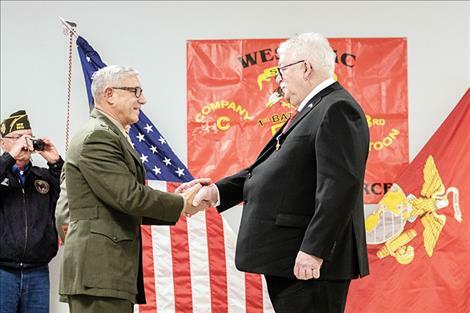 POLSON – More than a half-century after his battlefield heroics during the Vietnam War, former Polson resident Lance Cpl. James Stogner was awarded the Navy Cross – the nation’s second-highest decoration awarded for valor in combat. 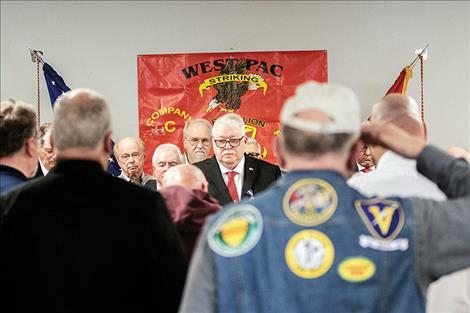 The Polson Veterans of Foreign Wars hosted the ceremony on Friday. According to the award citation, Charlie Company was assigned to assist in a sweep and clear operation in a small village, known as a well-established haven for enemy soldiers. As night fell, the Marines began to take on intense fire from automatic weapons and grenades from a nearby tree line, resulting in devastating casualties among the command group and platoons. During the battle, a ricocheted bullet struck Stogner’s rifle, slamming it back into his face and breaking his nose. His rifle was inoperable. The enemy exploited the situation and overran fellow Marine Lance Corporal Elijah Fobb’s position. He was captured and dragged back to the cover of the tree line. Upon hearing the tortured screams of Fobbs from behind enemy lines, Stogner, instead of slipping away and saving his own skin, headed out in search of his captured Marine brother. Using the darkness as cover and armed only with his Ka-Bar knife, Stogner crawled through the thick vegetation and enemy trenches. Stogner eventually found Fobbs and slung him over his shoulder. They were in a fight for their young lives as they struggled back through the dark to friendly lines. Fifty-two years later, the twelve Marines who were with Stogner, during the battle were present at the award ceremony along with Montana U.S. Senator Steve Daines who served as master of ceremonies. “It’s a proud day for Montanans. It’s a proud day for Americans and I am honored to be here,” Daines said. 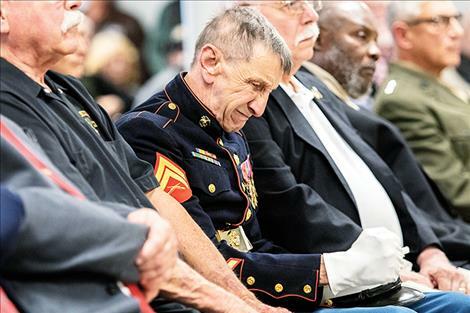 Lieutenant General Frank Libutti spoke in front of the crowd of more than 100 friends, family and fellow warriors gathered to honor Stogner for saving another Marine.